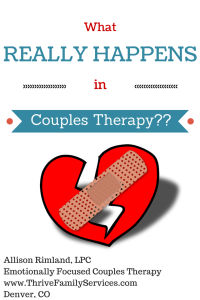 What will we do in Couples Therapy sessions? 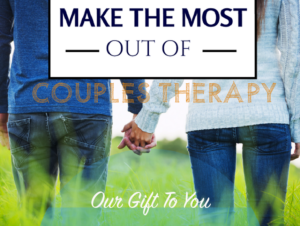 As couples counselors, we have lots of couples say, “I’ve never done couples therapy before. I don’t know what to expect.” It creates a lot of anxiety when you don’t know what’s coming. You may worry that things will get worse. You may worry that your partner will say things that are really hard to hear or spell bad news for your relationship. You might be concerned that you will be in therapy forever. You know you don’t want to be blamed for all the problems. You might be concerned that the therapist will tell you that you should divorce or give up on the relationship. Well, we would like to help ease some of your worries about couples counseling. No one wants to feel blamed for problems in the relationship and the truth is, they aren’t. Couples get caught in negative patterns where each responds and reacts in ways that perpetuate the problems. Sometimes, partners may come in expecting their therapist to determine who is at fault. We have never seen a quicker way for someone to call it quits on the therapy (or the relationship) than to feel like their partner blames them and won’t own their part. We will be finding the negative cycle blocking your closeness, and this is our new common enemy. Couples know how to argue and get stuck in their negative patterns just fine on their own. We don’t want to waste your time, money and hope by letting you argue as usual. We will interrupt you (firmly but politely), slow things down, and help you understand and share your feelings in a way that invites listening, not reactivity or defensiveness. Most people in struggling relationships know how to communicate just fine. You likely communicate quite well with friends, coworkers, strangers, etc. So, why do you have a hard time communicating with your partner or spouse? The answer is that you are caught by a negative pattern of reactions, feelings unspoken, and confusing or hidden ways of trying to get your needs met. There’s a lot more going on underneath the words that isn’t being communicated. In Emotionally Focused Couples Therapy, we know that teaching you Communication Skills won’t get to the root of the issues, and won’t fix your problems long-term. Research of couples arguing shows that people just don’t use intellectual, heady types of communication skills in the heat of an argument. It’s all well and fine to learn them, and you may even improve communication in your easygoing moments. But, in reality, when you’re upset and you need good communication the most, you react from your gut at lightning speed. You typically don’t stop to think about using “I statements” and reflecting the statements your partner just made. We will be looking closely at what’s underneath your arguments and fueling those negative patterns. We will be identifying the blocks getting in the way of sharing those underlying feelings with each other. We will help you practice reaching out to each other with those feelings. After a while, you will begin to see your negative pattern coming and know how to pull the emergency break and reach out with an olive branch to your partner. Your relationship is getting better when you have successes staying out of your negative cycle, and especially when you start to see it coming and know how to get out. 5. For a while, you will work really hard and will probably feel exhausted during and after sessions. Most of the time, it will be well worth it, and maybe the most meaningful thing you have ever done. The reason couples end up in couples counseling is pretty simple. They aren’t turning to each other and having vulnerable conversations. When you are ready (aka, no longer escalated in arguments), we will be asking you to practice turning to one another coming from your heart. This softer, more vulnerable sharing can be scary, feel uncomfortable, or be utterly foreign for you. No doubt about it, turning toward vulnerably is hard work. But it is so worth it. Our brains know the difference, and our bodies know the difference. 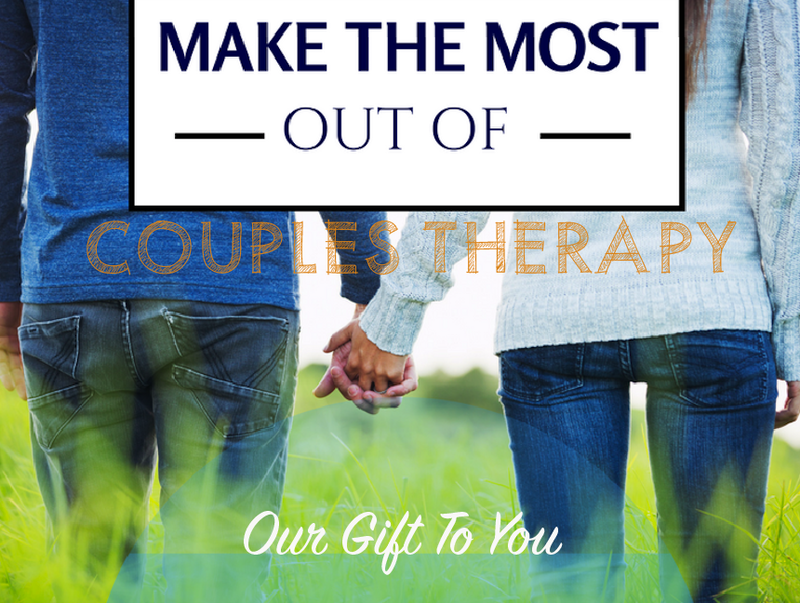 Good couples counseling, like research-based Emotionally Focused Therapy is a deep, bonding experience. Though it’s normal to be a little nervous about starting couples counseling, don’t let worries about the unknown stop you. Fear of the unknown is temporary, and we can help you with it. Losing the love of your life or hurting in your most important relationship can last a lifetime. To keep up with our latest tips & info for having the best relationships you can, sign up for our newsletter. What a great explanation of what couples can expect from counseling! I so agree that in all relationships there are ruptures. Many couples who I see will ask me: “How do we don’t get stuck?” I like to tell them that getting stuck is, indeed, a part of any relationship; however, the difference between connected and disconnected couples is the way they repair their moments of disconnection. Are they able to come back to one another and say: “We got stuck! Let’s try it again” or are they holding grudges for days feeling more hurt and lonely? Thank you for sharing Allison! Great post! Thanks for reading, Marta! We had a very interesting discussion at the EFT training about the fact that breakthrough joy and sustained joy are a huge marker for secure (or growing secure) attachment, in both infants and couples too. The interesting thing is that we can’t get that sustained joy when there have been hurts or upsets that we don’t heal. The only way back to the joy is through the pain with a repair and a partner who begins to show up for us in those moments. Trying to avoid conflict or squash upset feelings doesn’t work at all, either. In fact, our bodies and brains use tremendous amounts of energy trying to avoid feelings or stuff them. And then, they come out anyway via disconnecting ways like criticism, shut-down, etc. So interesting what we’re learning about the brain and secure attachment, isn’t it? I LOVE your website! I just recently opened my own practice and I love how you explain Couples Therapy! Wow, what a compliment, Beverly. Thanks for visiting and saying hello. Best of luck in your private practice!!! Help! Why does he withdraw from me?